Marcia received her bachelor’s degree from the United States Naval Academy and subsequently served in the Marine Corps as a Logistics Officer, including a combat tour in Iraq. She has served her church in different capacities over the years and she now calls North Coast home as she is completing her internship there to graduate with her M.A. in Licensed Professional Counseling. 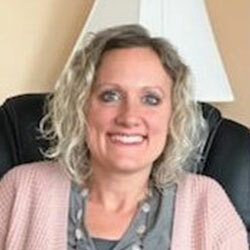 She is working under the supervision of Mark Yoder, LPCC-S.
Marcia uses a combination of cognitive—behavioral therapy, person-centered therapy and when requested, incorporates aspects of the Christian faith and biblical principles. Marcia is married and has three kids. She enjoys spending time with her family and friends, being outside (when it’s warm! ), working out (crossfit and running), playing sports with her kids and reading.